This is intended to be an FAQ for questions that we receive from visitors or new students. If you don't see your question addressed here, please feel free to call us at (208) 840-0766 or send us an email! I'm interested in trying out class. What should I bring? If you're coming to train for the first time, we want to congratuate you on making one of the best decisions of your life! When coming to class for the first time, we ask that you show up a few minutes before a class's scheduled start so that we can have you fill out paperwork for new students. If possible, contact us ahead of time to make sure that we know you're coming, so we can welcome you onto the mats. For your first day, all you need to bring is yourself, and some athletic clothes (such as shorts, a t-shirt, athletic top, leggings, etc.). Please make sure that you have showered recently, and your finger and toe nails are trimmed. Because martial arts involve close contact, personal hygiene is extremely important. Other than that, be prepared to enjoy training some of the most fun and effective martial disciplines in existence! This is a frequent question for children and adults, and a very important one. Many people believe that because martial arts are filled with throws, takedowns, joint locks, and other techniques, that it must be exceptionally dangerous. On the contrary, martial arts training is one of the best overall decisions you can make for your health! While there is an inherent risk to any intense activity, modern martials arts training is heavily focused on safety. Because you can "tap out" at end training or a match at any time, practitioners are able to test their capabilities in a safe and engageing way. Further, Colossal requires that everyone on our mats have respect one another, and emphasizes the safety of our students. Martial arts training also provides a wide range of benefits, including increased cardiovascular health, heightened reflexes, building discipline, weight loss, increased muscle tone, and mood improvement. Further, the martial arts lifestyle provides many auxiliary benefits, as practitioners often improve their diet and exercise behaviors to enhance their training! Why do we wear the gi / kimono? The training uniform used in jiu jitsu and judo is known as a gi, or a kimono. It has been used for centuries because it reflected the everyday dress of the time. Over the years, the gi design has changed to make the uniform more durable by reinforcing stitching, using heavier cloth, and utilizing a number of different fabric weaves and cuts. Today, the gi is still applicable for effective self-defense training. All of the grips that can gained on a gi can also be found on the shirts, hoodies, pants, and coats worn today! There are many modern examples of clothing being used to control or submit an opponent, just as it was centuries ago. It should be noted that not all of Colossal's classes require a gi. Many of of our instructors and students compete actively in both gi and no-gi rule sets. 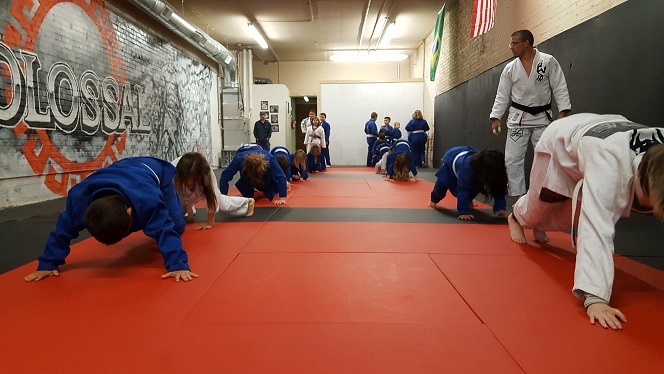 Because our students fight in jiu jitsu, judo, submission grappling, and mixed martial arts (MMA) competitions, it is important our training accomodate a wide variety of training goals. How do promotions work in jiu jitsu and judo? Belt promotions are a frequent topic, and a controversial one. Everyone has the mental image of a black belt from popular media, who is able to beat multiple attackers with ease, and is unbeatable in hand to hand combat. The reality is that promotions are simply a way to show the progress that a student in making in their art, as determined by their instructors. In adult jiu jitsu, there are five ranks: white, blue, purple, brown, and black. As a student regularly attends class, learns technique, and is able to apply that technique against resisting opponent (in sparring, randori, or in competition), their instructor will track their time, and promote them. 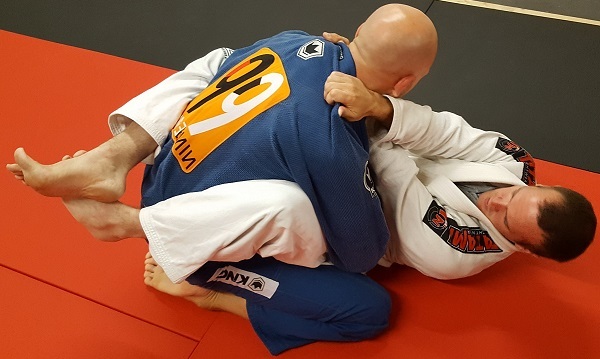 Jiu jitsu in particular is famous for holding its practitioners to a high standard, and requiring students to apply techniques on resisting, highly-skilled opponents to gain promotion. For jiu jitsu, it is expected to take between 8-12 years of consistent training to achieve a black belt, with anywhere from 2-4 years spent at each of the previous ranks. I would like to try out class, but I'm not interested in competing. Should I train here? Absolutely! Our school is open to anyone who wants to train, regardless of their goals. While we have many students who do compete, it is by no means required to train here.